This is not intended as a review of Communization and its Discontents. If I were to write a review of the book it would simply be: it is a good book, you should read it (hell, you can even downloaded it for free, so there is no excuse not to). This is intended instead as a series of provocations for further reflection. I think that it might be useful to situate the book alongside previous waves of translation and adaption. As with previous generations, namely Post ’68 thought and Autonomia we are dealing with European thought, primarily French in terms of the work of Théorie Communiste, Gilles Dauvé, Tiqqun, etc., framed in its own particular struggles and politics, being imported to Anglo-American contexts. There is a crucial difference, however, and that is the fact that the case of the first two this translation was primarily academic. 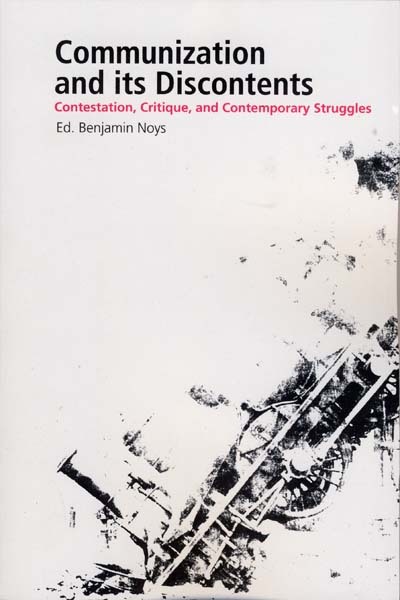 This is particularly the case with the first, Post ’68 thought from Foucault to Rancière has transformed the academy, constituting Theory as a new object or method, but this transformation could only wax nostalgically over the barricades that created it. While Autonomia existed for a long time as a para-academic field, traveling through reading groups and issues of Semiotext(e) (until the publication of Empire, which made it part of mainstream academia, for better or worse), it was still the case that actions such as auto-reduction, the strategy of refusal, and pirate radio were read about rather than enacted. 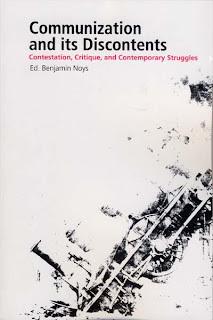 Communization has a different trajectory, as much as it can traced to the publication of a new round of Semiotext(e) publications its history also encompasses a series of actions, most specifically the occupations of campuses in California and New York in the 2009-2010 academic year. It would perhaps be an overstatement to say that Communization is the only, or even the only recent, intellectual import to have political effects, but it might be accurate to say that it is one that had political effects prior to its academic effects. When the history of Occupy Wall Street is written it will include Santa Cruz and Berkeley alongside Trahrir Square and the actions in Spain and Greece as its prehistory. This is not to say that Occupation is synonymous with Communization, but there are distant echoes of the latter in the former, which can be glimpsed in every refusal to offer demands, in every insistence that the Occupation, with its distribution and circulation of the basic conditions of existence, food, shelter, and libraries, is its own politics. This raises an important question of translation, not just the translation of words and terms but practices and politics. One shared idea of the various trajectories and traditions of communization is the rejection of any “identitarian” basis of politics, of the working class as an identity for radical struggle. It is argued that any program based on such an identity can only reaffirm what it seeks to transform. The goal is not to affirm the worker identity, but to destroy it as a fundamental pillar of the reproduction of capital. Not to be too dialectical, but such strategies look very different without the backdrop of the worker’s movement and traditional parties. As Alberto Toscano asks in his contribution, “But what is it to be a theoretical heretic after the political death of orthodoxy?” There is a tendency to continue to fight old battles, and if one looks hard enough, it is always possible to find yet another representative of the orthodoxy, standing around selling papers. However, focusing on this risks missing entirely the new oppositions and recuperations that take different paths. It seems that we are already seeing some of the pitfalls of this, as the Occupations become subject to new age, individualistic, and populist recuperations. Translating a politics must create new arguments against new opponents. If Autonomist Marxism’s shift from the focus on the dynamics of capitalist exploitation to focusing on the antagonism of the working class as the determining factor of capitalist development can be described as a kind of Copernican Revolution, fundamentally reorienting the direction and locus of struggle, then perhaps Communization can be understood as a kind of general relativity, the focus is on neither capital nor the working class, neither identity or pole of the relation, but on the reproduction of the capitalist relation itself. Capitalism is understood to be first and foremost a relation, or a series of relations, the selling of labor power, the commodity form as the form of all needs, and so on. This shift to the capitalist relation itself makes it possible to see other relations, gender relations and educational relations—to take two examples from the book, as equally integral to the production and reproduction of capital as the exploitation of wage labor. Moreover, these classical relations, the relations of class, of wage labor, are no longer dominant as unemployment and precarization cast individuals out of the work place, and finance and debt create new strategies of accumulation. The capitalist relation permeates all of society, displacing traditional divisions of production and reproduction. As Jasper Biernes writes of students, “Students confront the crisis of reproduction directly, as the cost of job training (tuition) increases, and as the value of such training decreases. Students are a proletariat in formation, denied a middle-class future, indebted like the rest of the working class but indebted before they have begun to earn a wage full time.” The focus on the capitalist relation, in the broad sense in terms of everything that produces surplus value, has a great deal of advantage in terms of encompassing struggles beyond the site of production. (This is part of Occupy as well, as much as it could be considered anti-capitalist it is an anti-capitalist movement of debtors, students, and those outside of what used be called the working class, but not outside of capital. This is why the spaces that are being occupied are not factories, but schools, parks, and quasi-public spaces, such spaces correspond to the diffuse nature of exploitation) However, in the case of much of the communization theory, the expansion of the definition capitalist relation is still conducted in fairly economic terms, gender relations, educational relations, are included insofar as they provide the basis for capitalist accumulation. Reproduction of the relations of production is not, as it was for Althusser, considered in terms of the ideological dimensions, the reproduction of subjectivity. (Although there has been suggestive work lately bridging these two radically different dimensions of Marxism). It seems to me, and this might just dovetail with my previous point, that such work is necessary as well, as much as it might be avoided for its association with orthodoxy and the academization of the Marxist project. If the current occupations are going to become something other than symbolic protests against capital, or invocations of “Americans taking care of Americans,” then they must confront the ideological as well as the material basis of the reproduction of the class relation. The latter remain long after the former have dissolved: the wage and persistent employment may have been displaced as economic relations, but they are still "in force," as Paolo Virno argued, still fundamental for the reproduction of subjectivity, if not the reproduction of capital. That is why every Occupation, every nascent communization, is immediately met with the cry "Get a Job!"